Nigel Gellar, traditional owner, West Arnhem Land, Australia. Although located on opposite sides of the world, Australia and southern African countries share colonial histories in which newcomers prevented indigenous people from employing age-old practices of using fire to manage their lands. This was because in the temperate European countries the settlers had left, fire was often seen as an evil to be avoided and suppressed at all costs. It was assumed that the newly settled territories were wild places where the first peoples exercised no control or custodianship over nature. Many indigenous people, however, in savanna lands across Australia and southern Africa, had been purposefully lighting fires for countless generations before the newcomers introduced formal proscriptive laws and regulations. Indigenous people on both continents did this for many reasons. Fire was not only employed to follow ceremonial practices, but also to ensure that these fire dependent landscapes were able to support the plants and animals upon which the people relied. Traditional knowledge had taught them that early season burning prevented the accumulation of vegetation that fed destructive late season wildfires and would also have decimated the local biodiversity. Now, new innovative methods of land management developed in northern Australia, combining traditional aboriginal knowledge with contemporary landscape management techniques, are tapping into carbon abatement funding to bring back traditional management. Where once the traditional owners of Arnhem Land (aboriginal-owned land in the Northern Territory of Australia) would have walked through the country lighting managed fires on foot, now such age-old approaches are being combined with dropping firelighters from helicopters. “My parents told me from an early age that we need to burn our land,” says senior ranger and Arnhem Land traditional owner Dean Yibarbuk. A group of Australian indigenous rangers who travelled to Namibia last month told a gathering of land managers from several Southern African nations — including Namibia, Mozambique, Zambia, Angola, South Africa, Zimbabwe, Tanzania and Botswana — how the Australian model has been working. The group had come together to gauge whether the Australian’s experience could be adapted in other parts of the world. This exchange was hosted by the United Nations University Traditional Knowledge Initiative (UNU-TKI) and Namibian community-based natural resource management NGO Integrated Rural Development and Nature Conservation (IRDNC). Namibian rangers discussed fire management with indigenous Australian fire ecologists. 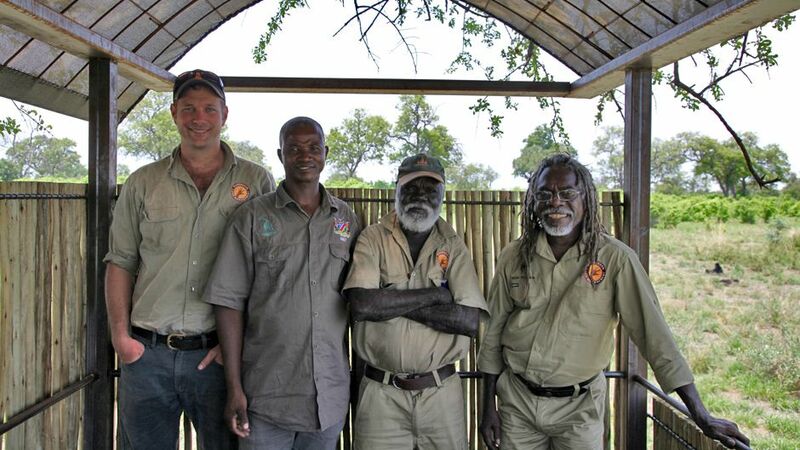 From left to right: Shaun Ansell, Wardekken Land Management Australia; Singwanga Matambo, a Namibian Parks Ranger; Nigel Gellar, Wardekken; Dean Yibarbuk, Wardekken. “My parents told me from an early age that we need to burn our land,” said Dean Yibarbuk, a senior ranger and Arnhem Land traditional owner at the workshop in the Namibian town of Swakopmund. An Australian government-funded initiative implemented by UNU has found that many savanna lands across Southern Africa, Latin America and the Asia-Pacific region share traditional practices of using fire to manage the land. In recent times, however, these practices have often been lost — leading to an accumulation of flammable ground vegetation that facilitates late dry season destructive wildfires and, ultimately, higher global emissions. 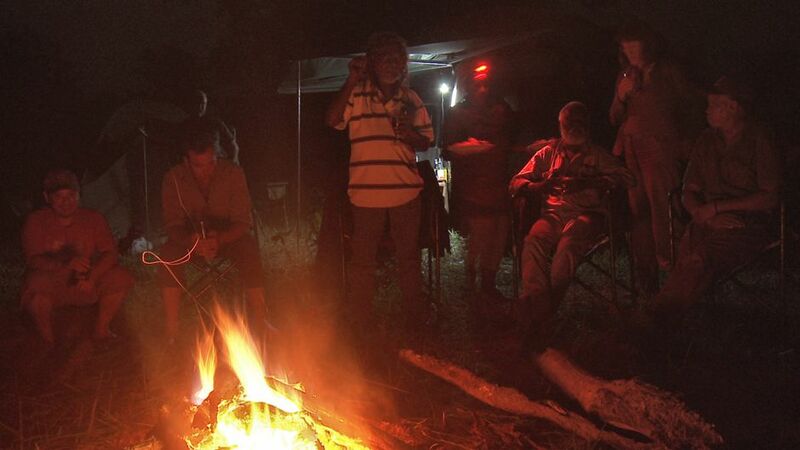 This initiative is designed to share Australia’s early burning experience using indigenous knowledge with government officials and local communities in other countries and explore the viability of adapting this experience to set up similar emissions abatement models in these diverse other contexts. There are clear gains to be made in battling climate change from using early season burning in savanna areas to reduce the release of greenhouse gases. Currently, savanna fires are responsible for approximately 12 percent of the globe’s annual methane (CH4) emissions and 28 percent of annual nitrous oxide (N20) emissions. While both gases are less prevalent than carbon dioxide (CO2) they are far more potent. Methane produces about 21 times as much warming as carbon dioxide, while nitrous oxide is 300 times more effective at trapping heat. Studies in Australia show the management of savanna through early burning can reduce methane and nitrous oxide emissions by more than 30 percent. Ongoing research is also investigating what amount of emissions reductions could be brought about via the carbon sequestration provided by aiding biomass accumulation. Early indications suggest it might be as much as five to 10 times greater than the abatement from methane and nitrous oxide alone. Globally it has been suggested that this abatement method could reduce global greenhouse emissions by as much as 1 GtCO2e/year. It could also make a significant contribution to the Bonn Challenge of restoring 150 million hectares of degraded forests by 2020, as well as the more recent endorsement by the New York Declaration on Forests to cut natural forest loss in half by the same year. While also providing strong benefits to biodiversity, this approach to cutting emissions can also provide job opportunities for remote communities around the world. 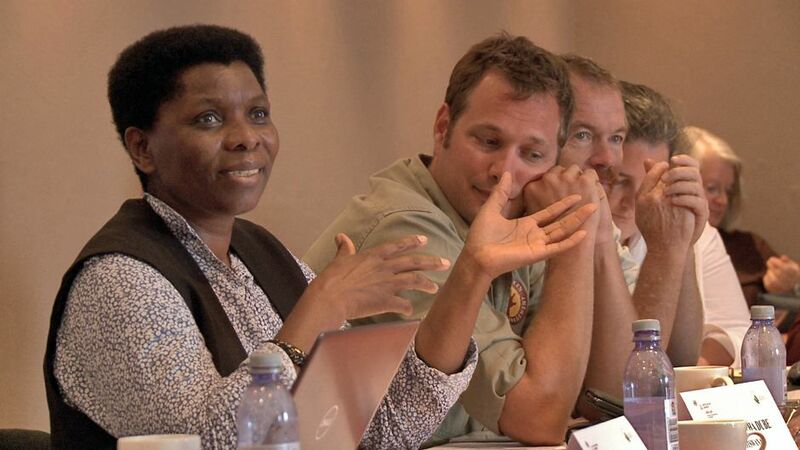 Professor Opha Pauline Dube, from the University of Botswana, told the workshop that one of the major challenges in re-introducing indigenous fire management practices in southern Africa is political will. Opha Pauline Dube speaks at the Southern Africa Regional Workshop. “We have to persuade policymakers that not all fires are bad and that we can fight ‘bad fires’ with fire,” she said. She added that achieving the level of funding required to re-introduce sustained fire management will be challenging, given the myriad of development challenges demanding the attention of national governments and overseas donors. The indigenous rangers at the workshop emphasized the importance of community support and traditional connections to the land in their work with the West Arnhem Land Fire Abatement (WALFA) project in Australia’s Northern Territory. The WALFA project, which employs over 200 local people, provides an impressive example of multinational-funded carbon abatement in land management. In 2006 US oil and natural gas company Conoco Phillips agreed to provide $17 million over 17 years to buy abatement from early savanna burning conducted by indigenous groups on indigenous-held lands as an offset requirement linked to opening a liquefied natural gas plant in Darwin. Whether similar arrangements tapping into international resource companies’ sense of Corporate Social Responsibility (CSR) can be achieved in southern Africa, or other parts of the world, is now being explored. Getting savanna lands back under control to prevent subsistence farmers from becoming trapped in spirals of increasing poverty is an urgent matter, stressed Garth Owen-Smith, a technical consultant and the former founding co-director of Namibian-based IRDNC. Government officials and indigenous fire ecologists from three continents shared ancient fire knowledge and modern management practice the UNU Learning Exchange in North East Namibia, December 2014. During an IRDNC-hosted field trip before the Swakopmund workshop, nine international delegates saw an example of this firsthand in Namibia’s Bwabata National Park, where indigenous people have been using their traditional fire practices for centuries. The group also visited parts of the East Zambezi Region to observe a community-based planned early burning project that IRDNC initiated in 2007 in partnership with government and communities. The visit provided the Australian indigenous rangers and local Kwhe peoples a chance to share firsthand their similar knowledge of ancient fire management. A major advantage of the savanna fire management practices pioneered in northern Australia is the way they tie together a number of different strands of human and environmental well-being. Not only do they reduce emissions, improve ecological health and biodiversity, but they are supporting local communities’ welfare by creating employment and enterprise development opportunities through more effective and secure land management. There are also indications that better managed savanna lands can lead to ecological benefits in adjoining landscapes, such as helping to prevent the further degradation of rainforest. “Research in Australia has demonstrated how savanna fire management can prevent encroachment into rainforest by protecting rainforest margins and can preserve rainforest pockets within savanna woodlands that may otherwise be destroyed by late-season fires,” said Sam Johnston, head of the United Nations University’s Traditional Knowledge Initiative. Johnston added that in addition to Southern Africa and Latin America, his team is also exploring the possibilities of using traditional savanna fire management practices in Australia’s Asian neighbourhood, including Indonesia, Timor-Leste, Papua New Guinea and Myanmar. 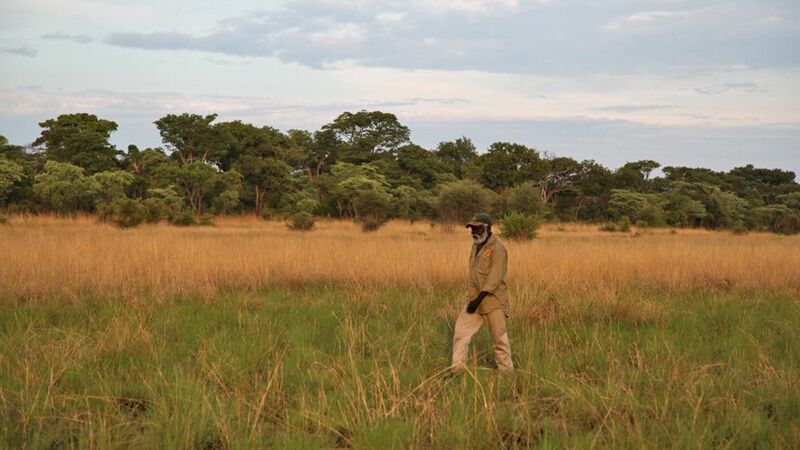 Such opportunities offer not just a chance to generate emissions reductions that can lead to real global impacts, but also allow the original peoples of savanna lands to explore the traditional land practices they share across distant geographical and cultural divides. Australia and Africa Search Pre-colonial Past to Manage Climate Future by Catherine Monagle is licensed under a Creative Commons Attribution-NonCommercial-ShareAlike 4.0 International License. Catherine Monagle is a programme manager and Senior Fellow with the Traditional Knowledge Initiative of the UNU Institute for the Advanced Study of Sustainability (UNU-IAS). An Australian national, Monagle graduated with degrees in science (ecology and evolutionary biology) and law from Monash University, and undertook studies in international law at the University of Leiden in the Netherlands. She holds a Master of Laws from the Australian National University and was admitted to legal practice in the Supreme Court of NSW. Monagle has particular expertise at the intersection of international law, natural resource management, biodiversity, genetic resources, climate change, traditional knowledge and intellectual property rights, and has an interest in science in environmental regulation. In these areas she has advised governments, international organizations and NGOs. She is currently acting as Secretary of the Expert Taskforce on Global Knowledge Governance being undertaken by the Global Economic Governance Programme of Oxford University. She is also currently reviewing legislative frameworks for the protection of the marine environment in Australia, and working with traditional owners in managing intellectual property rights and interests in the context of biodiversity and natural resource management in the North of Australia.